Lanefab’s goals for energy efficiency unfold from a broader vision of sustainability that looks at the city as whole system instead of just focusing on individual projects. When looked at through this lens, it becomes clear that simply adding more green buildings to a city doesn’t necessarily result in the kind of changes that are needed to address global challenges like climate change. Instead, what is needed is an approach that actually contributes to net improvements in a variety of metrics, including regional GHG emissions, energy consumption and water consumption. The easiest way to achieve this goal is to couple highly efficient new infill construction with substantial improvements to existing buildings. This tandem approach can result in a project that has added living space into an existing walkable neighbourhood while actually reducing the city’s GHG emissions and energy consumption. This is an example of ‘net-postive’ design. At Lanefab, our broader goal is to create a net-positive business model that can reconcile economic growth and the imperative for reducing our shared footprint. See Lanefab principal Bryn Davidson's TEDx talk on Net Positive development. There are many ways to measure how green a building is, but the bigger question is: "Is your project making the world measurably better?" Home energy and sustainability retrofits are undeniably net-positive - they reduce the real GHG emissions and water consumption for not just the home, but for the city and region. New buildings, by contrast, (even if built to high standards) usually end up adding to the total energy and water consumption of a region. In looking at where our construction dollars are spent, we need to look more closely at including renovation, retrofit, and replacement as part of our project. We also need to focus more on the impact that a building's location has on the total GHGs being emitted. 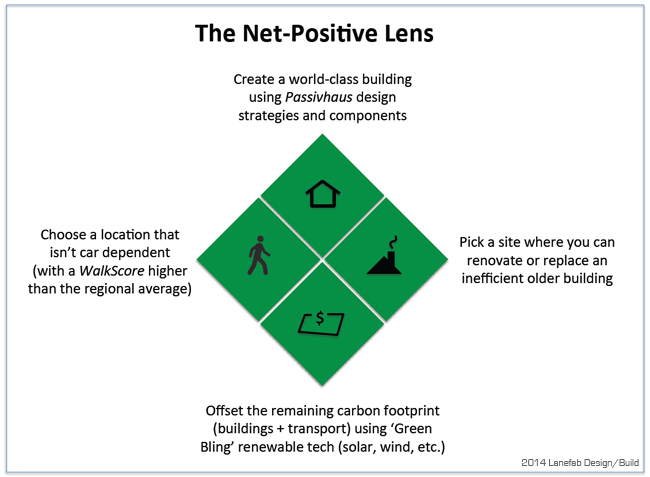 In general we need to shift from a focus on green buildings, to a focus on net positive projects. How good are your buildings?